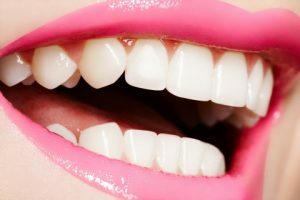 When it comes to whitening your teeth, you have many options to choose from. In general, with most teeth whitening kits, you’ll have to wait anywhere from two to four weeks to start seeing any change in tooth color. If you don’t want to wait, your best bet is professional teeth whitening, because you’ll get much faster results. The teeth whitening solutions that cosmetic dentists use are much more effective than store bought teeth whiteners because they are more concentrated and can penetrate more deeply into the tooth structure. The peroxide that is available at the store has a strength of approximately three percent, while the peroxide from your dentist has a strength of approximately 35 percent. This gives professional whitening the ability to reach deeper stains and give you better results. The one size fits all mouth trays or strips that come in whitening kits will not fit many people’s mouths and are not designed to cover the entire surface of the teeth. This means that not all the surfaces of the teeth will be whitened and the solution could easily get on your gums, leading to sensitivity and irritation. On the other hand, the take-home whitening trays that you’ll get with professional teeth whitening are custom-made just for you! If you’re unhappy with the color of your teeth, call our cosmetic dentist today! We would be happy to help you find out why your teeth are staining and how best to brighten your smile.